event. Imagine the colorful spectacle of 30 or more hot air balloons that will fill the sky with the breathtaking Green Mountains as the back drop. 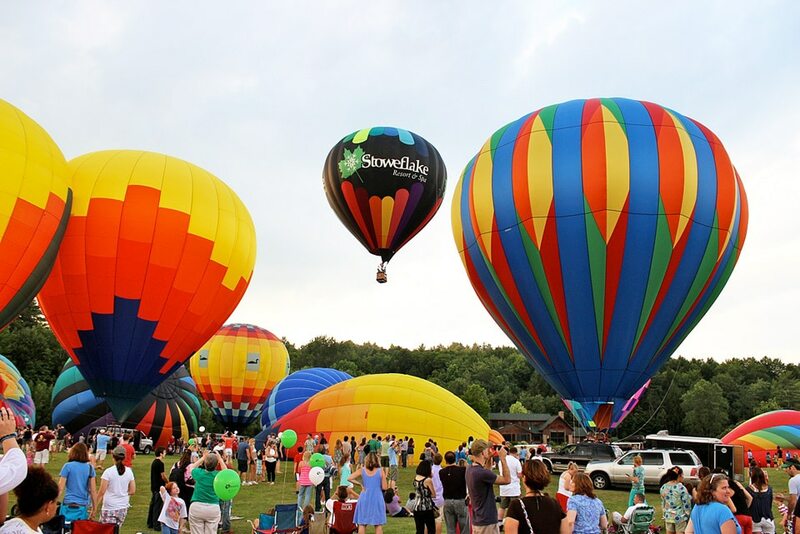 The Stowe Vermont Hot Air Balloon Festival will be 2 days of fun outdoor festivities. In addition to the awesome display of hot air balloons, other festival features include hot air balloon rides, a kids activity corner, live music, good food, a beer and wine tent, craft vendors, and a spa tent! Yes, a spa tent offering chair massages and facials. Time: Sunrise Balloon launches at 6:30 am. (Sat & Sun) Gates to the festival open at 4:00 pm. Live entertainment starts at 5:00 pm. Cost: $10 Admission to Festival (kids under 12 are free). Some festival activities may have additional fees (such as spa services). Bring a blanket to relax and enjoy the festival grounds. No coolers or pets allowed on the grounds..
Make the Stoweflake Vermont Hot Air Balloon Festival a must see this summer. Better yet, make a getaway plan. After you have enjoyed the festivities, escape the crowds and treat yourself to a relaxing stay at the Rabbit Hill Inn ( just 1 hour away from Stowe Vermont ) Stay a few nights. There is so much to do and see here! This entry was posted in General, Things To Do, Uncategorized and tagged adult only hotels in Vermont, adult only resorts in Stowe Vermont, adult only resorts in Vermont, bed breakfast inns near Stowe Vermont, Hot air balloon festival near Rabbit Hill Inn, Hot Air Balloon festivals in New England, hotels near Stowe Mountain, how much are the balloon rides at the Stoweflake balloon festival, how to book a hot air balloon ride at the Stoweflake balloon festival, how to get to the Stoweflake Hot Air Balloon Festival, how to make reservations for hot air balloon ride in Stowe balloon festival, information for Stoweflake Hot Air Balloon Festival, places to stay near Stowe Vermont, schedule of events for Stowe Hot Air Balloon Festival, Stowe Vermont Hot Air Balloon Summer Festival 2018, Stowe Vermont Hot Air Balloon Summer Festival 2019, Stowe Vermont summer events, Stoweflake Vermont Hot Air Balloon Festival 2018, Stoweflake Vermont Hot Air Balloon Festival 2019, summer festivals near Rabbit Hill Inn, Vermont Hot Air Balloon festivals, Vermont summer festivals, when is the Stowe Hot Air Balloon festival by leslie. Bookmark the permalink.